Approximately one in every three American adults suffers from high blood pressure, or hypertension. This figure includes around half of all adults over 65-years-old. 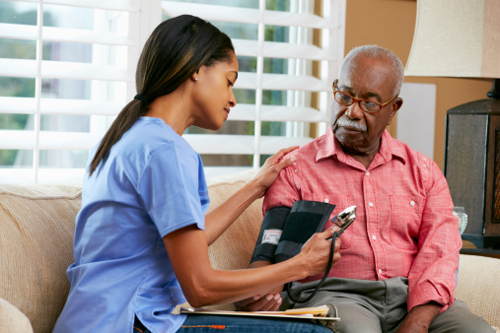 According to a new report published by the U.S. Centers for Disease Control and Prevention (CDC), 47% of American adults with hypertension are not properly controlling the condition. The CDC data is based on a survey conducted between 2011 and 2014. The good news is that the number of people controlling their blood pressure has actually improved over the years. A previous CDC data brief from 2013 found that 48% of Americans with high blood pressure were not controlling it. In 1999, over 68% had failed to control their hypertension. On the downside, the new data still falls short of the national and regional initiative for the Healthy People 2020 goal to have only 40% of Americans with uncontrolled blood pressure, according to CDC researchers. Normal blood pressure has a systolic pressure between 120 to 129 millimeter of mercury (mm Hg) and a diastolic pressure between 80 to 85 mm Hg. High blood pressure is considered when a systolic pressure is 140 or higher and a diastolic pressure is 90 or higher. If hypertension is not controlled it can lead to serious conditions such as diabetes, heart disease, and kidney problems. High blood pressure is also called the “silent killer” since there are often no signs or symptoms of the condition. The CDC report also found that the overall rate of high blood pressure has remained consistent since 1999 at a rate between 28% and 29% of the population. It was also found that one in three people between 50 and 59-years-old have hypertension, and two in three over 60 have the condition. The problem with high blood pressure control is that many people dislike taking antihypertensive drugs. The most common medications for hypertension include diuretics, angiotensin-converting enzyme (ACE) inhibitors, beta-blockers, angiotensin II receptor blockers, renin inhibitors, and calcium channel blockers. On the other hand, high blood pressure can also be lowered without medications. For example, studies have found that the Dietary Approaches to Stop Hypertension (DASH) diet can effectively reduce high blood pressure in hypertensive patients. The DASH diet is high in vegetables, fruits, high in fiber, low in saturated fat and total fat, low in cholesterol, and moderately high in protein. It also contains foods with nutrients that help relax the artery walls, including magnesium, calcium, and potassium. People can also control blood pressure by reducing alcohol and caffeine consumption, quitting smoking, reducing stress, losing weight, and from regular exercise for at least 30 to 60 minutes, three or more times per week. Natural supplements that help lower high blood pressure include hawthorn extract, coenzyme Q10 (CoQ10), hibiscus tea, aged garlic extract, fish oil, vitamin C, passionflower, valerian, chamomile, dandelion leaf, reishi mushroom, and the amino acid taurine. Yoon, S., et al., “Hypertension Prevalence and Control Among Adults: United States, 2011-2014,” Centers for Disease Control and Prevention web site, http://www.cdc.gov/nchs/data/databriefs/db220.htm, last accessed November 13, 2015. Thompson, D., “Nearly Half of Americans With High Blood Pressure Not Controlling It: CDC,” HealthDay web site, November 12, 2015; http://consumer.healthday.com/circulatory-system-information-7/blood-pressure-news-70/nearly-half-of-americans-with-high-blood-pressure-not-controlling-it-cdc-705146.html. Balch, J., et al., Prescription for Natural Cures: A Self-Care Guide for Treating Health Problems with Natural Remedies Including Diet, Nutrition, Supplements, and Other Holistic Methods (Hoboken: John Wiley & Sons, Inc., 2004), 92-97. Nwankwo, T., et al., “Hypertension Among Adults in the United States: National Health and Nutrition Examination Survey, 2011-2012,” Centers for Disease Control and Prevention web site, http://www.cdc.gov/nchs/data/databriefs/db133.htm, last accessed November 13, 2015. “10 ways to control high blood pressure without medication,” Mayo Clinic web site; http://www.mayoclinic.org/diseases-conditions/high-blood-pressure/in-depth/high-blood-pressure/art-20046974, last accessed November 13, 2015. “Choosing blood pressure medications,” Mayo Clinic web site; http://www.mayoclinic.org/diseases-conditions/high-blood-pressure/in-depth/high-blood-pressure-medication/art-20046280, last accessed November 13, 2015. “High Blood Pressure,” Centers for Disease Control and Prevention web site, http://www.cdc.gov/bloodpressure/, last accessed November 13, 2015.